As you scout the spaces for an office in Mohali, you may find the entire process tiring and frustrating, given the amount of choices you have. Yes, Mohali is a happening city that is fast turning into a commercial and industrial hub in Punjab. Hence, the demand for office space has spiked and finding the ideal space requires more than cursory planning. Before you begin looking for office space, get your budget in order. In Mohali, just like in any other city, the price varies based on the location and size of the office. Hence, in order to work out your budget, you will need to shortlist a few locations in the city and freeze on the size of the office. Be realistic when it comes to your budget by scouting different areas and getting a feel of the price of the properties in those locations. Every property has some associated costs that you need to be aware of. Whether you are buying or renting the office space, it is important that you find out about the hidden costs in the form of common area costs, utility costs, housekeeping costs, security costs, and others. This way, you will be able to discern whether you can actually afford the space you are interested in. Choose a location based on your business. For instance, Sector 85 in Mohali is a commercial hub and home to many offices, restaurants, cafes, and banks. This makes it easy for you to entertain business clients, while making sure that your employees can access restaurants and banks with ease for their personal use. Also, the sector is easily accessible by different modes of transportation, so employees, clients, and visitors will be able to commute with ease. Every office requires certain amenities to function optimally. When you narrow down the list of spaces for your office in Mohali, check and compare the amenities. Today, it is normal for developers to offer 24-hour power backup, security, surveillance, pantry services, housekeeping, and ample parking space. These are the amenities any office worth its while should have. 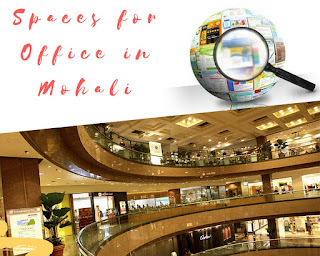 Use these tips to find the ideal office space for your business in Mohali. Of course, there are other factors that you may have to consider too; nonetheless, these tips give you a starting point to begin your search for the ideal office space in the city.